Got two weeks’ worth of amazon/sales correlations in this post, and they’ve got a couple little weird data nuggets buried inside ’em. Get ready for a quick data-dump followed by some wild child speculation. Same as usual, really. In the previous summary post I mentioned that The Wind Rises had seen a pretty notable drop-off in its BD data, losing almost 20,000 units in a week. At the time, I said my prevailing theory was “typo”, but now we have a second week of decline, although this time it’s more like 900 copies lost. And the week after keeps counting from those benchmarks. So it just being a glitch is less likely. What could have happened? Here’s the deal – the film came out on video in the US almost exactly a year ago (late November 2014 for BD and DVD versions). It put up good but not earth-shattering numbers, lost the oscar in a year where Pixar wasn’t competing. The release is a year old, and we’re several months removed from any sort of publicity bump that could lead to a boost in sales. So a store, maybe B+M (possibly walmart? ), maybe amazon, sees it has a lot of copies in stock and they’re selling very slowly relative to the remaining count. And thus, massive returns that went on for about a week, with a few laggy copies from more remote warehouses taking a little longer to get shipped back. I’d lean towards a B+M here because it seems like it’d be harder to move niche films in your average big-box store, and optimizing stock and distribution is all the more vital. IF this is true we might now be able to explain why The Cat Returns went negative back in August – B+M retailers could be overestimating their ability to sell Ghibli movies. The fact that it’s negative rather than a zero means sales to B+M outlets could be counted on shipment, not end user sale. This serves as an alternate (to preorders) plausible explanation as to why first-week sales are inflated, and more so for some titles than others. The week ending in November 15th was the first to show monumental separation opening up between DBZ: F “BD” and “DVD” edition counts. This is an extremely big hint as I continue to try and find out which of the 3 active releases is being counted in which of the 2 available categories. 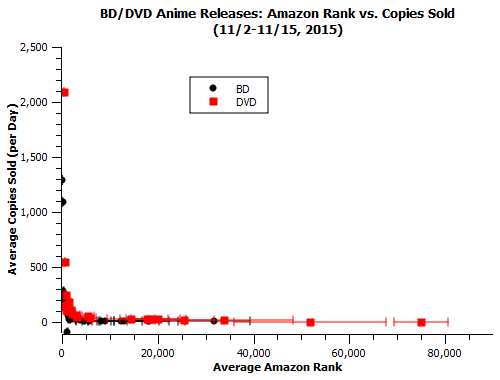 This big separation happened in the most 11/9-11/15 week of data, when the “DVD” edition sold 1029 copies while the “BD” edition sold 7663, a factor of 7 difference. By contrast, the previous week had DVDs selling 14k and BDs selling 9k. 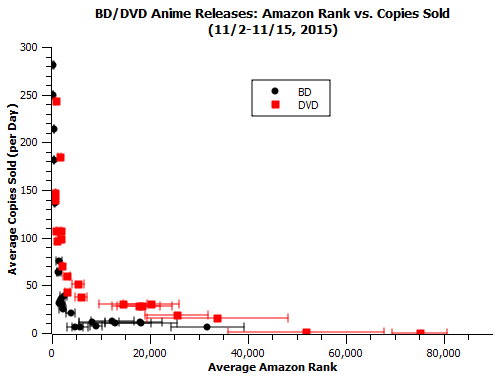 Let’s start with what we can say for sure about the amazon ranks of the LE and RE BD/DVD combo editions. The RE ranked around #113 [tough range to predict, but possibly around 1000-500 copies per day]. The LE ranked around #669 [worth an average 169 copies per day]. DVDs were not tracked this week, but they ranked #2890 on the first day of the next week [worth an average 28*3 copies per day w/ DVD multiplier]. Also, it’s worth noting that the DVD-only editions are unlikely to be counted as anything but DVDs. For comparison, the BD column had about 1094 copies each day in sales, and the DVD coulmn had about 147 copies each day. So the BD column has to contain the RE for things to make sense this week. DVDs would also be severely underestimated if it were just the DVD editions in that column, so add the LE into that column. So my working theory is that, for DBZ:F, DVD=DVD+LE sales and BD=RE sales. Additionally, we know from the price distributions given in the release-week nash reports that ‘DVDs’ have been getting 45$/sale and ‘BDs’ have gotten 20$/sale. I checked with the most recent week’s sales totals, and those ratios are basically unchanged (42$/DVD, 20$/BD). This corroborates with the idea that more expensive LEs are in the DVD column, and DVDs are a more minor player (if it were a 50-50 split, the average $/sale would be a lot lower for that column). This is all assuming, of course, that the tracking has been consistent for editions throughout, and isn’t split between stores in some weird way. So why, in the first place, did we see this sudden drop-off in the DVD column? There are a couple of possibilities. The DVD sales could have been bigger in earlier and dropped off abruptly. The funimation store (which I now suspect could be tracked by nash) may have run out of LE stock. Pricing levels (which I don’t track) could have changed in the way that made the combo RE the best all-around deal. Can’t definitively say which of those is accurate. 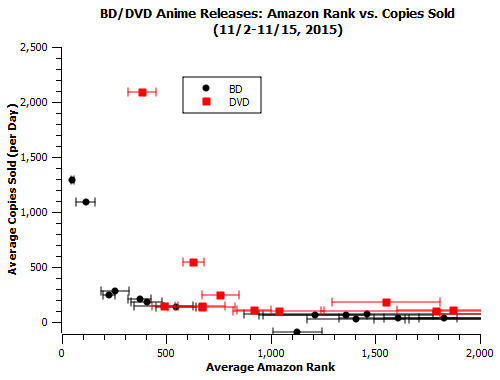 Strong World ranked terribly on amazon, and actually added zero copies to its count in the 11/9-11/15 week. We know from the ranks that week that it likely sold nothing on amazon, so this is basically just that plus it sold nothing anywhere else counted by nash. This is a nice little thing because it’s clearly only happening with this one title and the ranks are demonstrably in the dead zone so the explanation is uber-simple. A zero should theoretically happen sometimes for low-selling releases. Since it’s a long-term release, we can at least rule out returns – they likely would have happened way before now, and a store is more likely to just liquidate if it’s on the scale of tens rather than hundreds or thousands of copies (which is all one would need to counter typical SW sales, and this is a way-below-average week for it). This is, of course, assuming it was a one-week thing and the count didn’t stop permanently. As this project moves on, it feels like I’m understanding the system both more and less. On one hand, these oddities are leading to working guesses that, if right, explain other oddities and make the system self-consistent. On the other hand, there’s little hope of proving whether or not the most probable working guesses are actually right (due to a combination of the fundamental variance and designed opacity of the system being studied).